We have faced and overcome many barriers. Our physical and mental strength has been exhausted by everything that has come against us and tested the relationship between God and us. 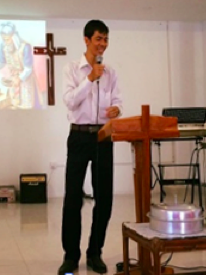 But we understand as Jesus said, “In this world you will have trouble”, because it is the arena of a great spiritual war – seen very clearly in Cambodia! Therefore, everything we do is challenged. But Jesus also said “Take heart for I have overcome the world”, so God is convincing us that spiritual success comes through remaining in his perfect peace. 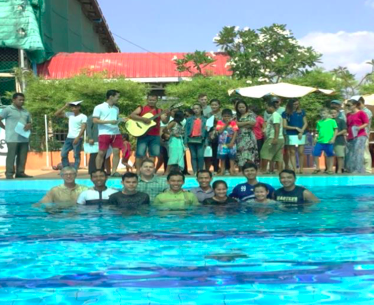 Here we share how Shalom Mission Cambodia has been led and what had happened during the first six months of 2018. “Martha, Martha, you are anxious and troubled about many things, but one thing is necessary. Mary has chosen the good portion, which will not be taken away from her” (Luke 10:41-42). Pastor Chanthea has encouraged our church members who face barriers through seeking God and listening for the still small voice of God from heaven. It might be hard for us to go through difficult times when we do not know what God will do with us, but He knows, and that is enough. Sitting at Jesus’ feet changes us so that we overcome the world. God is alive We celebrate Easter Day every year to commemorate the day Jesus was victorious over death. His resurrection gave final and irrefutable proof that He really was the Son of God and that he had conquered death once and for all. We are honored to be a part of Christ and we love to organize this in our Church, because His glorious promises of eternal life belong to us, and to all who believe in Him. On 22ndApril, 2018 we were delighted to see the young generation accepting Christ and receiving Baptism as they respond to God’s call to live in His Kingdom. It is amazing that people desire to commit to walking with Christ when they know it will mean difficulties, but the Lord means so much to them – they know He is truly amazing in uncountable ways. No matter how hard life is – God is able to teach us and give us strength to endure every obstacle. We have to reach the point at which our hearts are shaken and stirred with the knowledge that God is everything to us. They were declaring that God is the only true God and testifying that everything they do is for Him. Thank God for His goodness to His people. We were beyond thrilled to see them, born again, in the Lord, Jesus. Matthew 28:19 Therefore go, and make disciples of all nations, baptizing them in the man of the Father and of the Son and of the Holy Spirit.